The 5TH ITALIAN SCHOOL OF VIRTUAL ARCHAEOLGY will be organised by CNR ITABC andCNR ISTI, in cooperation with CINECA and University of Padova, and will be hosted by CNR-ISTI in Pisa. 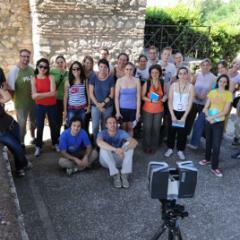 The school originates from the “Virtual Archaeology” national school, organized in 2009-2011 by CNR ITABC and University of Padova. From 2011 the School is part of the VIRTUAL HERITAGE INTERNATIONAL SCHOOL PROGRAM organized by the European Project V-MUST.NET , that connects 5 different national schools (UK; Italy; Cyprus; Sweden; Germany). The program includes: lectures from leading experts in the field; intensive exchange among students and teachers living in the same environment; a multidisciplinary approach and the inclusion of practical, hands-on experiences. The lessons will be also focused on the common needs of the practitioners in the field of Cultural Heritage, collected through the input of V-Must partners and the content of the applications to the course. Period : 1 – 12 July 2013. Fee: 500 Euro (including: materials, use of computers, software, lunches), VAT is included. The school is supported by V-MUST.NET, Eurographics Italian Chapter, MIMOS, ANA.